At a luncheon with business leaders on Tuesday, New Mexico Gov. Susana Martinez and Virgin Galactic CEO George Whitesides urged state legislators to complete work on an informed consent law designed to protect the space company from lawsuits. Whitesides also laid out a schedule for powered flights of SpaceShipTwo that has the vehicle flying into space by the end of the year. The appearance coincided with the release of a picture showing the latest test firing of the rocket’s hybrid motor in Mojave, Calif.
Editor’s Note: Once again, Scaled is not providing the length of the burn. Without knowing that, it’s difficult to determine precisely what was tested and why. Editor’s Note: Once again, Scaled is not providing any information about the lengths of the tests, which is a crucial data point. That is true for all six engine tests, including this pair, they have conducted since early November. Three of the four earlier tests were initially listed as having lasted five seconds, although those references were later scrubbed from the test summaries without explanation. Without knowing the burn lengths, it’s difficult to discern what’s actually happening here. There’s obviously activity, and lots of it at a unusually brisk pace. They’ve done six tests in two months, and 17 tests in the previous 3.5 years. So, that would be a very positive sign. But, beyond that….Are they testing the so-called “starter engine” that will get SpaceShipTwo into the transonic flight envelope? Or is it a new engine that is different from the previous design? The only thing for certain is: After more than eight years of development and with SpaceShipTwo approaching its first powered tests, the status of the vehicle’s engine is somehow becoming murkier. UPDATE: For some unexplained reason, Scaled Composites edited out all references on its log page to the length of the test firings (5 seconds) on three of the four listings below. I have heard that the other test, which took place on Dec. 6 in Mojave, was relatively short as well, an estimated 10 seconds. All objectives completed. Performed targeted 5 second hot fire as planned. Duration of burn chosen to allow examination of internal geometry. Third full scale firing of a rocket motor at Scaled’s test site under full control of the spaceship’s Rocket Motor Controller (RMC). All objectives achieved. All objectives completed. Performed targeted 45 second hot fire as planned. Duration of burn chosen to allow examination of internal geometry. 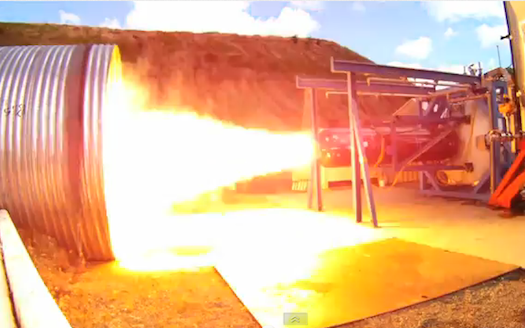 Second full scale firing of a rocket motor at Scaled’s test site under full control of the spaceship’s Rocket Motor Controller (RMC). All objectives achieved. Fifteenth full scale flight design RM2 hot-fire. 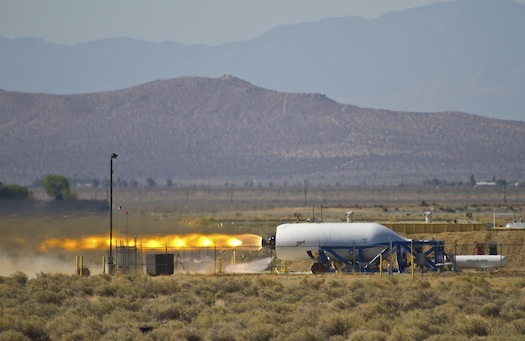 LauncherOne will be powered by a two-stage, liquid-fueled rocket, now in initial development by Virgin Galactic. The same rocket also is intended to ultimately replace the non-reusable RM2 hybrid motor that will power the SS2 to suborbit, Virgin says…. Fourteenth full scale flight design RM2 hot-fire. All objectives completed. Performed targeted 55 second hot fire as planned. Duration of burn chosen to allow examination of internal geometry. Thirteenth full scale flight design RM2 hot-fire. MOJAVE, Calif. (VG PR) – Virgin Galactic, the world’s first commercial spaceline, today announced that its passenger-carrying suborbital space vehicle, SpaceShipTwo (SS2), successfully completed its first glide flight test on June 26 since a recent integration period for rocket motor systems and maintenance. Also, on June 26, the spaceship’s engine, RocketMotorTwo (RM2), underwent another successful full duration test fire, marking the first time the company and its partners have undertaken test flight and test firing on the same day. 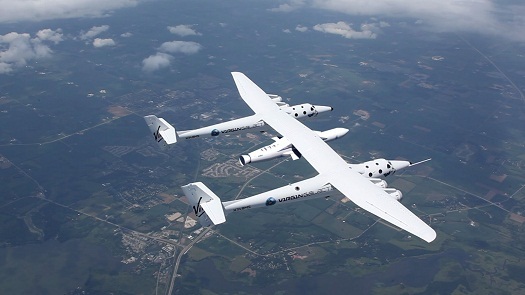 Both milestones prime Virgin Galactic to reach powered flight by the end of the year. CORRECTION: Virgin Galactic says this test did involve RocketMotorTwo. I regret the error. 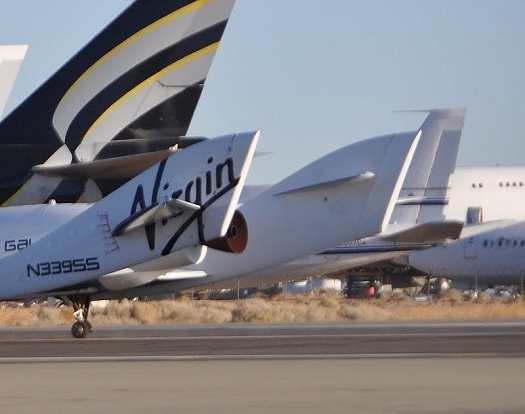 The engine hot fire done at Scaled Composites test site at the Mojave Air and Space Port on Wednesday does not appear to have involved the RocketMotorTwo that will be used on the SpaceShipTwo suborbital tourism vehicle, a careful reading of the test summary reveals. The summary for Hot Fire No. 12 on the Scaled Composites “RocketMotorTwo Hot-Fire Test Summaries” page says it was the “first full scale firing of a rocket motor at Scaled’s test site under full control of the spaceship’s Rocket Motor Controller (RMC).” [Emphasis mine]. Each of the previous 11 test entries on the page includes the phrase “full scale flight design RM2 hot-fire.” That phrase is absent from the summary for the brief test on Wednesday, which is reproduced below. RocketMotorTwo test firing file photo, still shot taken from video. Tests on RocketMotorTwo have begun in Mojave, which is a step toward integrating the engine into the SpaceShipTwo fuselage. The one interesting element is that unlike other test summaries, this one does not mention the length of the burn, which means it was a short duration event with a key emphasis on evaluating the test environment at the Scaled facility. As shown below, they were evaluating the test stand, data acquisition system, and other elements. 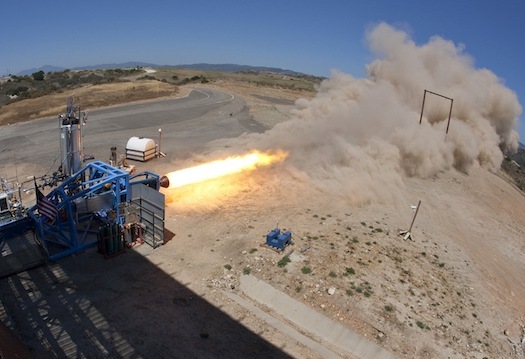 First full scale firing of a rocket motor at Scaled’s test site under full control of the spaceship’s Rocket Motor Controller (RMC). All objectives achieved. The difference between Scaled’s site and SNC’s site at Lakeside is the focus on using SS2 flight vehicle hardware. 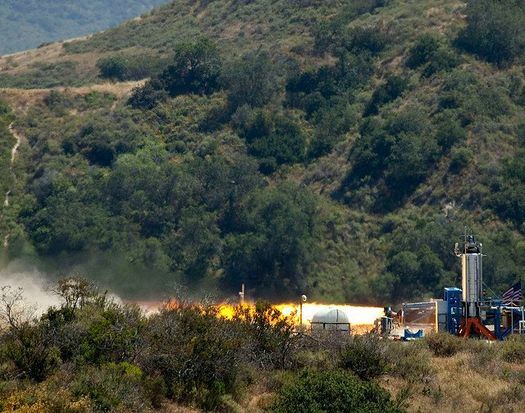 These tests provide an end to end test of all the vehicle’s rocket motor systems and additional confidence before committing the vehicle to powered flight test. The latest entry on Scaled Composites’s test summaries page. They’re still examining the internal geometry of the burn. Eleventh full scale flight design RM2 hot-fire. All objectives completed. Performed targeted 50 second hot fire as planned. Duration of burn chosen to allow examination of internal geometry. Richard Branson’s space travel company, Virgin Galactic, which is 32% owned by Abu Dhabi’s Aabar Investments, expects to finish developing its rocket engine in the next two months, the group’s chief executive said, marking a significant step in its ambition to become the first commercial space flight operator. The rest of this is behind a firewall.